Kitco helps you relive the excitement of the Original Six™ era with this commemorative series of silver coins from the Royal Canadian Mint that celebrates legendary goaltenders from each team. Kitco offers the pure silver NHL® Goalies: Glenn Hall Coin for sale on our online store. They played with passion and a rugged determination, carried by an enduring love for the game; in an era when there was little protective equipment, the hard-playing goaltenders of the Original Six™ hockey teams often risked injury as they fearlessly stood toe-to-toe against the prolific scorers of the 1950s and '60s. Each of these Canadian-born netminders brought their own style of play and made some of pro hockey's most memorable saves, all while setting the bar with impressive performance standards and helping to shape modern goaltending. The reverse design features a meticulously engraved portrait of goaltender Glenn Hall in his days of playing for the Chicago Blackhawks® during the NHL's Original Six™ era. The exceptionally detailed design finds the maskless Hall in the “butterfly” position he made famous, with his pads splayed against the ice and knees kept close together to protect the net's bottom corners; keeping his trapper low, Hall's gaze is fixed downward on the play as he protects the “five-hole” by positioning the blade of his stick in front of his knees. With a $10 CAD legal tender face value and limited mintage of only 8,000 coins, 1/2 oz Silver Glenn Hall Coins are an extraordinary hockey gift for fans who are truly passionate about their team, the game, and its history. Kitco offers this silver coin in a brown RCM branded clam shell fitted in a graphic box. Buy these  RCM fine Silver NHL® Goalies: Glenn Hall coins online at Kitco today. The Royal Canadian Mint is a Canadian crown corporation that mints all of Canada's circulation and legal tender silver bullion coins. Since it released Canada's first domestically produced coin in 1908, the Royal Canadian Mint has acquired a global reputation for silver coin minting excellence. Today, the Mint's superior technical capabilities allow it to set new benchmarks in silver bullion coin design and quality. Kitco is a trusted leader in the silver coin and physical precious metals industry. 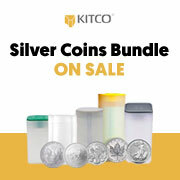 Silver coins and other precious metals sold by Kitco are recognized in silver bullion coin markets around the world. With our focus on silver coins, you can benefit from our low silver bullion coin prices and premiums that are highly competitive in the industry. At Kitco, we make it easy for you to manage your wealth.